As Christmas was approaching last year, I had received an email from a body building website that I had subscribed to a few years ago. The email’s subject line claimed that the article had found the supplement that was “the secret to avoiding holiday fat gain.” Since I’ve been a nutrition and fitness hobbyist for the last 3 years, naturally I was skeptical. But I opened the email anyway, expecting to see some pill with absurd amounts of caffeine, capsaicin, and green tea extract, all of which are known to help aid in weight loss and are found in many diet pills. Instead, what I found was something that I had never heard of. It was a supplement called “conjugated linoleic acid,” known more by its common name “Tonalin.” The article offered little scientific background as to how the supplement worked, so I simply read the article and left it at that. About two months later, the next email from this website came in and reminded me of this supplement. This time, I had more reason to delve into the subject matter, so I began to research the supplement. What was in it? Are there any natural sources of the compounds? What benefits does it offer in a strictly tested clinical setting? 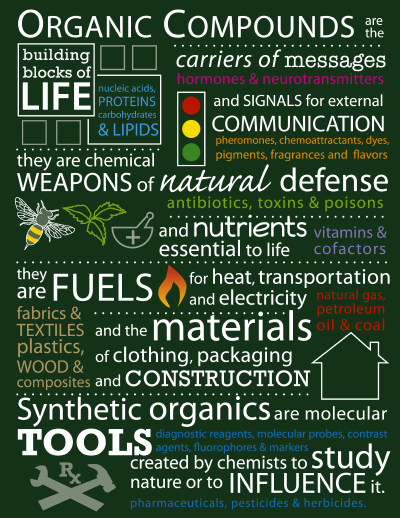 And what are the mechanisms behind its action? Because the original article did not explicitly state where their information had come from, I decided to perform a google scholar search on the compound “conjugated linoleic acid,” as well as search my textbook collection for information on this compound. What I found in my biochemistry textbook is that linoleic acid (note not conjugated) is an 18 carbon chain with two cis double bonds, and is an essential fatty acid that is obtained through the diet. It is used in the body as a precursor for a series of other compounds, most notably the eicosanoids that mediate the inflammatory response and act in other ways throughout the body. Conjugated linoleic acid (CLA), while identical to linoleic acid in chemical composition, refers to a class of isomers that have two double bonds in a conjugated arrangement (the double bonds are only separated by one single bond). Since I was especially interested in the nutrition aspect of health, fitness, and disease, I looked into the origin of this compound in nature. I found in the article “Regulation of fat synthesis by conjugated linoleic acid: lactation and the ruminant Model” that it is synthesized by bacteria within the rumen of cows and other ruminants, and can be found in their meat and milk. However, I did remember learning in my evolutionary medicine class about how human intervention in ruminant diets (feeding them grain and keeping them in tight quarters) drastically alters their biochemistry and the lipid content of their meat and milk. I looked a little more into this topic and found that grain fed cows (the majority of those from which supermarket meat and dairy are derived) have around twice the amount of fat as a percentage of total calories per ounce, and lower proportions of unsaturated fats (such as CLA) when compared to grass fed cows. Because a significant proportion of the ancestral human diet was hunted wild game, the ancestral human diet was likely much higher in CLA. This dietary difference is a possible contributing factor to the nonexistence of obesity in ancestral human populations, which can be observed through studies of modern hunter gatherer societies. This then lead me to the questions: what exactly does CLA do in the body, and how does it do it? Looking through the literature, I kept seeing a recurring theme. Repeated studies on mice have shown that supplementation with CLA does not reduce body weight. However, these studies did show that CLA supplementation decreases body fat percentage, and contributes to an increase in more metabolically active lean tissue (Figure 3). In other studies about CLA, it has been found that it can also act as a gene expression altering agent, and a fairly potent antioxidant, which is apparent upon its structural analysis (Figure 1 and 2). The conjugated double bonds in CLA offer great resonance stabilization to free radicals, meaning that they help to neutralize free radical species in the body. This action helps to prevent oxidative damage to biologically important compounds such as DNA or proteins, and preserves them so they can carry out their intended functions, and in turn helps to prevent cancer and other age related diseases. CLA has also been shown to increase the activity of some tumor suppressor genes, thus inhibiting cancer growth by another route. Learning of these effects of CLA excited me about the possibilities of its action in a fitness setting, where lean tissue growth is the goal and oxidative damage is a great concern. The mechanisms behind the action of CLA as an antioxidant are fairly well known, and contribute to a variety of health benefits related to disorders linked to inflammation. Studies in cows, specifically in their mammary glands, have shown pretty remarkable mechanisms behind CLA action. It has been shown that they can inhibit fatty acid synthesis in milk through several different mechanisms. This general mechanism is characterized by CLA down-regulating mRNAs of lipogenic enzymes, thus reducing fatty acid synthesis. CLA is found naturally in fatty acid synthesis pathways as an intermediate in biohydrogenation, where it acts naturally as part of a biochemical regulation mechanism in normal function. While this is not a directly relatable inhibition process to human adipose tissue formation/maintenance, it offers one of the many mechanisms carried out by CLA in mammalian systems. The principle mechanism by which fat synthesis inhibition is carried out, is through disruption of the normal functions of the sterol response element-binding proteins (SREBPs). These proteins are involved directly in the binding of promoter regions of genes that code for lipogenic enzymes. The SREBPs are in turn, controlled by expression of another class of enzymes. The molecular mechanism of CLA’s action is to inhibit these SREBP synthesizing and modifying (specifically enzymes that translocate) proteins, thus inhibiting the synthesis of one specific variety of SREBP. Fatty acid synthesis (as many other biochemical pathways) is a cascade system, and this inhibition early in the cascade offers great potential to halt the process with great success. The SREBP system is the system controlled by Spot 14 (S14), which is an SREBP responsive gene for a nuclear protein related directly to the transcription of lipogenic enzymes. This gene is different in that it is not only found in mammary tissue, but also adipose tissue, and other lipogenic tissues. Although its exact function has not been studied and remains unknown, S14 knockout has shown that lipid synthesis drastically decreases in mice, and CLA has been found to inhibit this enzyme. I was also intrigued by another mechanism by which CLA has been shown to work, which is more directly relatable to human adipose tissue deposition and maintenance. CLA has been found to act directly on lipoprotein lipase, stearoyl-coenzyme A desaturase, and peroxisome proliferator-activated receptor (PPAR) in human adipose tissue. PPAR acts as a modulator of adipocyte gene expression in that it promotes fat deposition, and CLA is found to either inhibit this enzyme, or cause a reduced expression of it in vivo. 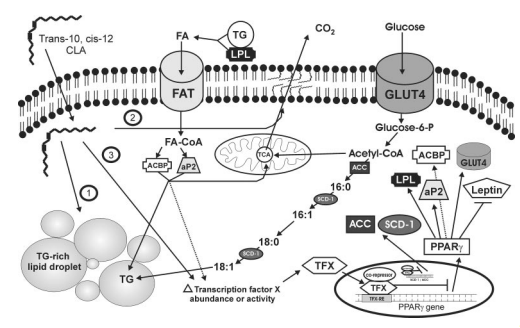 Although the exact mechanisms behind the actions of lipoprotein lipase and stearoyl-coenzyme A desaturase were not explained explicitly in the scientific literature, these mechanisms can be derived from knowledge of these enzymes and a hypothesized mechanism is shown in Figure 4. Stearoyl-coenzyme A desaturase is an enzyme that acts to transform saturated fatty acids into unsaturated fatty acids, which helps to influence the creation of new cell membranes in adipose tissues. Lipoprotein lipase acts to facilitate absorption of free fatty acids in the gut and blood into adipose cells. Inhibition of both of these enzymes results in an overall reduction of adipose tissue size, and can help prevent the deposition of new fat deposits (Figure 4). Learning of this mechanism was the tipping point in convincing me that this is a valuable supplement for me personally. As a regular weight lifter, in order to optimally build muscle I eat a calorie dense diet to compensate for increased metabolic needs and provide necessary materials for protein synthesis. As a result, fat gain tends to be a significant percentage of any weight that I gain. If this supplement has the ability to minimize fat gain in a high energy situation, then those calories that would be used in fat synthesis are freed to be contributed to muscle growth, and thickening layers of fat tissue would no longer block out those six pack abs I’ve been dying to see in the mirror. While much of this post is describing the fine details of mechanisms of CLA action, I hope that it has provided insight into how exactly this dietary supplement works, and has given some confidence to the skeptics of its efficacy. Due to my research, I now take CLA on a daily basis as part of my supplement regimen, and although results are characteristically slow, I have noticed a significant change in my body shape, muscle tone and muscle definition as a result in a few months time (not to say those results didn’t also come in part from my regular exercise regimen). Bauman, Dale, James Perfield II, Kevin Harvatine, and Lance Baumgard. (2008). Garrett, Reginald, and Charles Grisham. (2010). Biochemistry. Cengage Learning, USA. evolutionary medicine. Oxford University Press, USA. Park, Yeonhwa, K. Albright, W. Liu, J. Storkson, M. Cook, and M. Pariza. (1997). Wang, Li-Shu, Y. Huang, Y. Sugimoto, S. Liu, H. Chang, W. Ye, S. Shu, and Y. Lin. Cancer suppressor gene, protein tyrosine phosphatase, in human breast cells. Proto-col Slim-Fizz is a unique appetite suppressant that contains the groundbreaking fibre Glucomannan, which is a natural dissolvable fibre derived from pure Konjac.